Zubin Atré, amongst other avid travelers share their love for yoga wherever they go. It could be in the midst of a bustling piazza or against a gigantic mountain… home is where yoga nomads can roll out their mats.You know you have company on a vacation when you spot someone with their mat slung over the shoulder, sipping on kombucha and talking about the cosmos,” says blogger Anne in her post ‘Finding Yoga on the Road’. Anne belongs to the burgeoning tribe of yoga tourists, who travel for the love of yoga. 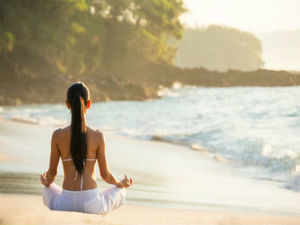 When in a new terrain, they will immediately look up the best yoga classes, try out some new-age yoga workshops and only then think about other touristy things to do. “When I visit a new city, the first thing I do is find a yoga studio because I know that no matter where I am in the entire world, I can feel at home the minute I step onto my yoga mat,” says Meredith Meyer, an advertising professional who runs a yoga studio in Chicago.Continue Reading..